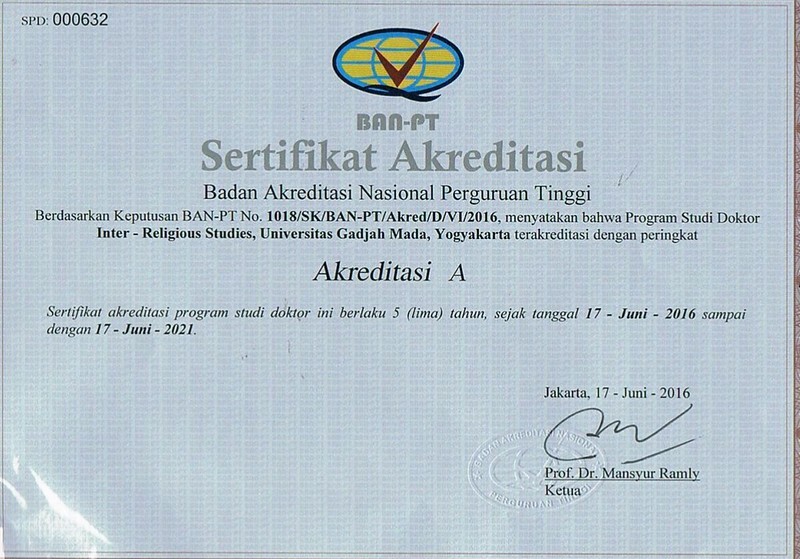 Indonesian Consortium for Religious Studies (ICRS) is delighted to announce that “A” accreditation has been awarded by the Badan Akreditasi Nasional Perguruan Tinggi (BAN-PT) for our study program in Inter-Religious studies. ICRS international Ph.D. program in Inter-Religious Studies is the only doctoral program in Inter-Religious Studies that is based in a major, multi religious, national university co-sponsored by Islamic and Christian Universities (UGM, UIN Sunan Kalijaga and UKDW). The accreditation has been much awaited moment for Indonesian Consortium for Religious Studies (ICRS), of which fabulous credit must be given to all ICRS faculties, staff and also students who have worked hard and gave their best performance in reaching this goal. Congratulations! !